With the free ArcSight Logger L750MB, you have download some associated SmartConnectors, Snare SmartConnector, Cisco IOS SmartConnector, Unix Auditd SmartConnector, etc. The configuration of each SmartConnector is customizable in order to activate batching, time correction, caching, QoS (Quality of Service), aggregation or filtering. 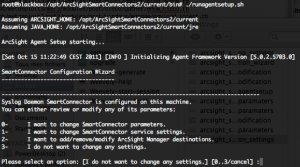 In this blog post we will show some examples on how to configure your … Continue reading "ArcSight SmartConnector Configuration User Guide – Part 1"